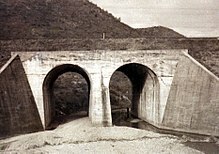 The No Gun Ri Massacre occurred on July 26–29, 1950, early in the Korean War, when an undetermined number of South Korean civilian refugees were killed by soldiers from the 2nd Battalion, 7th U.S. Cavalry, and a U.S. air attack, at a railroad bridge near the village of No Gun Ri, 100 miles (160 km) southeast of Seoul. The South Korean government-funded No Gun Ri Peace Foundation estimated in 2011 that 250–300 were killed, mostly women and children. The passage of 50 years has reduced the possibility that all of the facts can be known about the tragic incident that took place in the vicinity of No Gun Ri in South Korea. We have determined, however, that U.S. soldiers killed or injured an unconfirmed number of Korean refugees in the last week of July of 1950 during a withdrawal under pressure in the vicinity of No Gun Ri. The truths of No Gun Ri have taken root in the heart of South Korea. A memorial tower, museum and garden of mournful sculptures have risen from the soil of the central valley where the 1950 refugee massacre took place. In the United States, however, home of the agents of those killings, much of the truth remains buried, by official intent and unofficial indifference. In the 15 years since the world first learned of this mass killing, it has become increasingly clear that the U.S. Army's 1999-2001 investigation of No Gun Ri suppressed vital documents and testimony, as it strove to exonerate itself of culpability and liability, and to declare – with an inexplicable choice of words – that the four-day bloodbath was "not deliberate." But these suppressed archival documents, showing U.S. commanders ordering troops to fire on civilians out of fear of enemy infiltrators, are now on display at the peace park's museum, illustrating a growing divide in how No Gun Ri will be remembered – or not – on two sides of the Pacific. The South Koreans had been trying for years to have this incident, and others, recognized. They had brought petitions to the U.S. government, and in the mid-'90s, the U.S. government gave them a response, which said that it didn't happen and that U.S. troops were not in the region. Around that time a South Korean AP reporter heard about this and began working on it. And in the United States we began working on it as well. We interviewed more than 130 veterans. We spent weeks and weeks and weeks at the National Archives. And in the end, we were able to document this with interviews from GIs who were there, with survivors of this incident in South Korea who were there, and although there wasn't, we didn't find the document that points to this particular incident, we did find many documents describing such instances across the warfront. And this past week, my colleague Charlie Hanley and I reported on the letter from the U.S. Ambassador to Seoul informing the State Department that American soldiers would shoot refugees approaching their lines. And this letter, that we just reported last week, is the strongest indication yet that such a policy existed for all U.S. forces in Korea. And it's the first evidence that that policy was known to upper ranks of the U.S. government. The American soldiers played with our lives like boys playing with flies. Chun Choon-ja, a 12-year-old girl at the time of the massacre. People pulled dead bodies around them for protection … Mothers wrapped their children with blankets and hugged them with their backs toward the entrances. ... My mother died on the second day of shooting. Chung Koo-ho, age 61 (thus about 10 or 11 at the time of the incident). I can still hear the moans of women dying in a pool of blood … Children cried and clung to their dead mothers. The planes came, raining down bombs and big bullets. The planes shrieked past repeatedly. People ran for the shrubs and trees. A lot of people died. Something hot dropped on my back. It was the severed head of a baby. Dirt and gravel rained down. Oxcarts were burning ... Dead bodies and cows were everywhere, spewing blood. We thought it was safe. The tunnel I was in was packed with people. I saw people from my village and thought it was okay. Then the shooting came. Bullets ricocheted off the concrete and hit the people like popcorn in a frying pan. Mother wrapped me with a quilt and hugged me. It was shooting from both sides. When there was shooting coming from one side, we rushed to the other side. When the bullets came, we could not even raise our heads. We just dug under dead bodies. Yang Hae-sook who was 12, who reports that she lost an eye in the original strafing, and was then herded into the No Gun Ri bridge tunnels with other survivors, where her grandmother, an elder brother and a baby brother, as well as an aunt and her husband and their two daughters were killed. I just stood there and cried. From the hill, a soldier looked at me for a while with binoculars. He beckoned me to come up the hill. Some soldiers came and looked at me without talking. One of them checked to see if I was injured. ... They later sent me to the south on a truck. Park Hee-sook, who was 16, says she lost her father, mother and a sister before a U.S. soldier saved her. It was dusk. My 5-year-old son kept crying for food. My 2-year-old daughter had already been killed when her grandmother took her and walked outside in the hope of appealing to the soldiers. I crawled out with my son and climbed a hill. A terrible crackle of shooting came down and my son was hit in his thighs. Both his thighs were torn with bullets. It was strange, but my boy kept saying he wanted food and he wanted to go see his dad. I saw an American soldier and begged for mercy. I shouted to him that we were not bad people, not communists. But he shot at us again. A bullet ripped through my waist and hit my son's chest. I lay there still, my mind blank. Two soldiers came over, a fat one and a tall one. They looked down at us and talked to each other. Later more soldiers came and they wrapped my son in a white bag and buried him. They took me to an ambulance. That day, I saw the two faces of America. I remember the American troops searching all of us, and I remember I was very hungry … Suddenly, there were planes and bombs. My uncle covered his child, and I heard him say, "Oh, my God." I looked and saw his intestines had come out. The bullet had passed through his back and killed his daughter. They were shooting at us from this side. We ran out the other side, but they were shooting at us there, too. … I told my mother, "I've been shot," but she had my brother and sister, and she had to save them. She said, "Follow me if you can" and went on. This page was last edited on 18 May 2016, at 12:43.